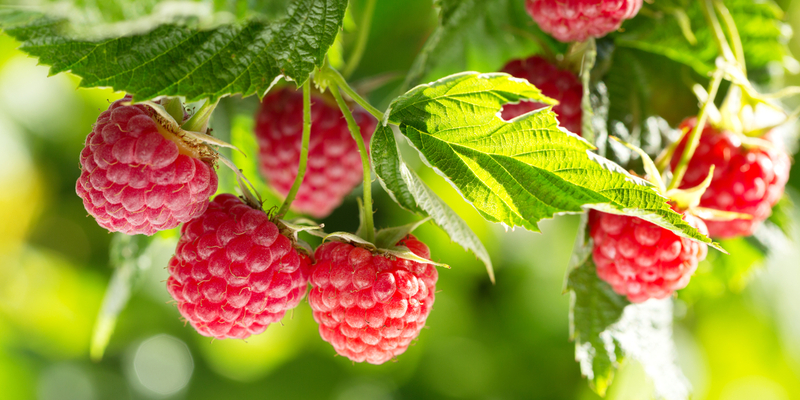 If you are looking to add big perennial fruit flavor to your landscape – then growing raspberries should high on your list! Raspberries are a low-maintenance perennial crop that can provide fruit quickly. And continue to produce for years and years to come. Raspberries are a member of the bramble or cane fruit family that includes blackberries and dewberries as well. And although they are considered a perennial, there growth style is a bit unique. Raspberries produce fruit during the second year of cane growth. Brambles produce fruit on 2 year-old canes. During the first year of growth, all of the plants energy is concentrated on building up strength. But in year two, the canes utilize the power from the previous year’s growth and produce their fruit. Although the canes die off after their second year, the plant continues to produce new canes each year as well. When growing raspberries, you can choose from red, black, and even golden varieties. This allows for an ongoing harvest on second year canes, year after year. Like their fellow bramble blackberry relative, raspberries can be grown on thorn or thornless canes. When it comes to where to plant raspberries, the more sunlight that can be found, the better. Black raspberries ripening on 2 year old canes. All brambles need a minimum of 6 hours of sunlight to form and ripen their fruit. But at least 8 hours of sun is a better choice. Raspberries do not perform well in wet or low-lying areas, so select an area with good drainage. Sloping hillsides work well. As will slightly mounding the soil where they will be grown. Raspberries prefer slightly acidic soil, although they will grow in nearly any soil type. Whether planting bare roots or tranplants, amend the planting hole with equal amounts of sand, compost and soil. This combination helps plants drain well, and have adequate nutrients for strong growth. Raspberries can be grown in both thorned and thornless varieties. If your location is not on a hilliside, mound the planting area a few inches above the surrounding soil to help with drainage. There are two styles of raspberry plants, uprights and vining. If you are planting vining styles, space plants around 4 to 6 feet apart. For erect types, space plantings 12 to 18 inches apart. Providing support for new plants can be helpful for plant growth and the gardener. Brambles will perform better, and be easier to harvest when support is provided. Fence lines trellises, and even post and wire supports all work well. Both upright and trailing or vining raspberry plants benefit from support, helping to keep plants off the ground and from falling over. It also makes harvesting much easier. Trailing varieties can grow 10 to 20 feet long, so fences, arbors, or post and wire supports are all excellent choices. Raspberries do not need much in the way of fertilizers to continue growing and producing. Add compost, along with sand to planting holes. Pruning vines and canes will help keep plants strong and healthy. For fall bearing varieties, cut back all growth in mid-winter to promote strong early-spring growth. For summer-fruiting varieties, simply cut back the brambles that produced fruit, leaving all first year growth brambles standing. The Heritage raspberry is a proven, old-time heirloom variety with good production. Sign up today to follow via email, or follow along on Facebook.